Promotion Division. FAS, (20') 447-7103. U.S. dollars. Bank ref: Ulster Bank, College Green, Dublin 2, Ireland. (yellow)- 2,000 MT, wheat (western white)- 2,000 MT. Quality: U.S. Grade No. 2 for all three. Packaging: barley and wheat 45 kg. bags, corn 50 kg. bags. Delivery: October 1984. Other req: labels must be in Arabic. BEEF BONE MARROW FROZEN (SWITZERLAND). Quantity: 10 MT per annum. Room 4945 South Building, Washington. D.C. 20250. BEEF LIVERS FROZEN CHOICE BEEF (EGYPT). Quantity: to be arranged. BEEP, PORK & MUTTON LUNG LOBES, GULLETS, AND LIVERS FROZEN (SOUTH AFRICA). month. For human consumption. Packaging: in 20/25 kgs. frozen blocks. abattoirs and comply with RSA specifications. Quote: CIF, C&F, and FOB. moisture 13 maximum; protein content 8 minimum per kg. of dry material. prices ports of Agadir, Safi, El Jadida, Casablanca, Kenitra, Tanger, Nador. Bank ref: Banque Marocaine du Commerce Exterieur, Casablanca, Morocco. prefers to deal directly with producers or suppliers. Delivery: ASAP. CHILDRENS' CANDIES (IRELAND). Interested particularly in innovative lines. ref: Bank of Ireland, Ltd., 84 Thomas Street, Dublin 8. CONTACT: Mr. G.D.
be free of live insects and defective kernels; 1984 crop. Packing: bulk. horns for manufacturing of handicrafts, ect. Quantity: 3-5 thousand lbs. 12-22 Queen's Rd.E. 25/F Bl.C, Hong Kong. Telex: 65222. Phone: 5-275725. EGGS (OMAN). Firm wishes to import table eggs weighing 50-60 grams each. not sterilized. Bulk packaging. Shipping: 3 shipments w/one-week intervals. 411089 or 411124 SY ALAF. Cable: ALAF. Phone: 221689/221893. & CANNED VEGETABLES (MALAYSIA). Quality: grade one. Quote: CIF Kuching. however, expected to be substantial. Best quality. Institutional packaging. Zealand. Quote: C&F in details including FOB price and shipping cost. date. Bidding date: 11:00 a.m. September 21, 1984 at NLCF conference room. KIDNEYS AND LIVERS (EGYPT). Quantity: 500 MT livers and 100 MT kidneys. lamb. Shipment: each lamb to be packed individually in white gauze bags. 1984. The Committee is entitled to increase or decrease this quantity. Authority for Supply Commodities (GASC), 24, Gomhouria Street, Cairo, Egypt. LIVE GIANT RABBITS (JAPAN). 100 rabbits for trial shipment. Best quality. NATURAL CANNED FRUIT JUICES (CANADA). Wants natural canned fruit juices. Quantity: 24/330 ml tins. Packaging: easy open tins. CONTACT: Mr. L.B. shipment. Quotations: C&F. Bank ref: Fuji Bank, Main Office, Tokyo. CONTACT: Mr. Katsuma Shin, Okura & Co., Ltd., 2-3-6, Ginza, Chuo-ku, Tokyo. Telex: OKURA A. J. 22306. Phone: (03)566-6588. PECANS, UALNUTS (IRELAND). Pecans shelled halves; walnuts broken. confectionary. Packaging: units no larger than 25 kgs. Quote: CIF Dublin. POWDERED MILK (THE NETHERANDS). Quantity: 300 MT. Packaging: 25 kg. bags. Delivery: ASAP. Other req: 1.25 percent fat; human consumption. every three months. Quality: first milling grade (not fully milled). Cameroon. Packaging: exporters' choice; should be labelled ETS Kassambara. Kassambara, 05 B.P. 659, Abidjan 05, Ivory Coast. Telex: 23596 or 23775. Amari, Yanmar Trading and Contracting, P.O. Box 18260, Jeddah, Saudi Arabia. irrevocable Letter of Credit at sight and cover insurance. CONTACT: Mr. D.
SORGHUM AND CORN WHITE (IVORY COAST). Quantity: around 40,000 MT. packages. Corn oil in both 18 kg. plastic drums and consumer packages. in U.S. dollars. Bank ref: Habib Bank Ltd., Foreign Exchanges Branch, M.A. monthly shipments of 27,353 MT. Quote: FOB U.S. port and C&F Guayaquil. Bank ref: Banco de Londres y America del Sud, Ltd., Casilla 556-A, Quito. Ministry of Supply, P.O. Box 830, mman, Jordan. Telex: 21278 MIESUP JO. HEAT HARD RED uWITER (BANCLADESH). Quantity: 20,000 1T. Quality: U.S.
C&F free out Chittagong/Chalna. Bank ref: American Express IBC, Dhaka. December 26, 1983 for food ingredient and additive laws in West Germany. 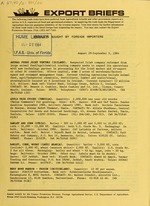 copy of the Supplement free of Charge. each set I have ordered. Make payable to: U.S. DEPARTMENT OF AGRICULTURE/FAS. Foreign Agricultural Service, USDA, Washington, D.C. 20250. FOREIGN AGRICULTURAL SERVICE, Room 4945-S.